Twin sisters Evelyn and Alice Conrad each weighed just 1 pound 2 ounces when they were born 17 weeks early on October 3rd, 2018. 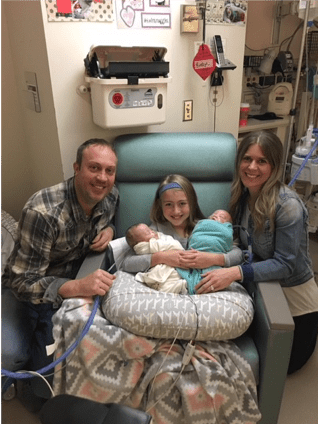 Their mother, Rachel, initially went into labor one week earlier, “When I first started going into labor, they told my husband Darin and I that the girls would have a 50% survival rate. 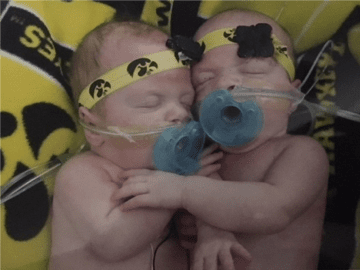 The University of Iowa Hospitals and Clinics were able to slow my labor and held off the birth for an additional six days, which increased the girls’ survival rate each day.” The medical team explained that the newborn twins will have to stay in the Neonatal Intensive Care Unit (NICU) until at least January 30th. 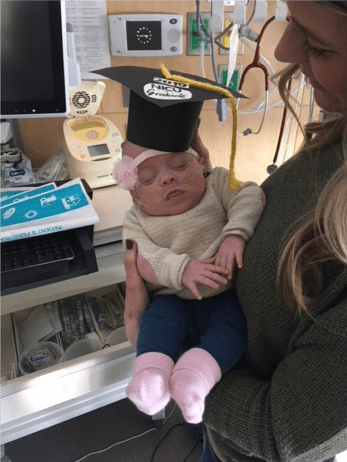 With warnings from doctors and nurses about the potential highs and lows they could face for the next four months, the Conrads settled in at the Ronald McDonald House in Iowa City just down the road from Evelyn and Alice. Out of the 160 days the girls stayed in the NICU, December was definitely a hard month on the Conrads. “Evelyn contracted a virus which set her back slightly, and Alice was diagnosed with Necrotizing Enterocolitis (NEC) which is a disease that affected her intestines. December was hard on us, but thankfully the girls fought hard and pull through. I’m not quite sure what we would have done that month if we weren’t staying at the Ronald McDonald House. Being able to stay so close and see my daughters each and every day is something I will never forget” said Rachel.